Scheduled to open in February of 2019 is the luxury The First Roma Dolce hotel in Rome, Italy. It will be a five-star boutique hotel located Rome’s Via del Corso, near the historic Piazza del Popolo. The First Roma Dolce hotel will offer guests the concept of living a sweet urban life for today. It is a modern version of “La Dolce Vita” or “The Good Life.” The vision will materialize via the lens of contemporary design, inspired well-being and creative gastronomy. The opening next year will also be the second property in Rome by The Pavilions Hotels & Resorts. It joins the amazing The First Roma Arte hotel. In addition, The Pavilions Hotels & Resorts portfolio consists of boutique properties across Asia and Europe. The new boutique hotel is located in a 19th century palazzo on Via del Corso. Designed by visionary architect and urban planner Giuseppe Valadier, the hotel was developed in a historic building. Locally, the Italian urban life has been redefined here for many centuries. 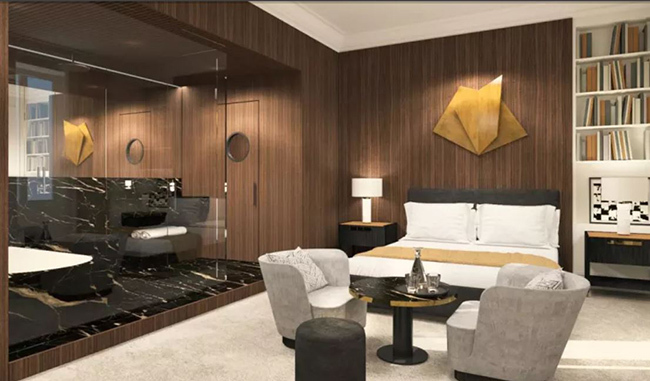 The First Roma Dolce will feature 23 stunning suites and guestrooms. As a result, each offers the urban contemporary comfort of a private apartment. Plus you’re perfectly situated in Rome’s lively historical center. Seven Prestige Rooms offer Queen, King or two Twin beds in rooms of 270-square-feet. Comfortable and cozy overlooking the palazzo’s courtyard, these accommodations are extremely quiet and feature a large walk-in shower. Two Prestige Fitness Rooms offer a King bed or two Twin beds in 375-square-feet that include a mezzanine loft fitness area with state-of-the-art Technogym® workout equipment, allowing guests to pursue their personal fitness plans in complete privacy, with the assistance of an expert personal trainer or they may connect to the Technogym app to set programs. Two Prestige View Rooms feature King or Two Twin beds in 225-square-feet in a light and airy space overlooking Via del Corso, with a desk, designer armchair, selection of books and a luxurious bathroom with rain shower. Five Dolce Suites are a generous 401 – 515-square-feet and provide soothing quiet space overlooking the inner courtyard with an inviting bedroom; a relaxing living room with sofa, desk, armchairs and a collection of books, and elegant bathroom with rain shower, Turkish bath and large bathtub. Four Suites with View and Balcony are spacious and airy, with 500+-square-feet of stylish comfort that includes a private balcony overlooking Roman life along Via del Corso, an inviting bedroom, living room with desk, armchairs, designer sofa and collection of books, and sumptuous bath with a rain shower, Turkish bath and large whirlpool tub, and ensuite Kinesis Personal Vision fitness apparatus. Three Suites with View are bright and inviting, offering 500+-square-feet of space surrounded by warm wood paneling and views of Via del Corso, a choice of King or Twin beds, a welcoming living room with desk, armchairs, sofa and collection of books, a marble bathroom with rain shower, Turkish bath and large bathtub, and en suite Kinesis Personal Vision fitness apparatus. In addition, several Family Room Combinations are also available. These are ideal for accommodating larger groups. First is a 1,000-square-feet Suite that features two bedrooms plus two living rooms. Also, there’s a 740-square-foot Suite that offers two bedrooms and two living rooms. Both have the latest fitness equipment. As new hotel guests arrive at The First Roma Dolce hotel, they are greeted by an ancient threshold. After checking, they are escorted to their suite or guestroom beginning on the third floor. The decor is stylish and so luxurious. As a result, nothing has been overlooked. You will notice the gorgeous wood paneling, as well as bookcases filled books covering fine pastry and culinary traditions, history, art and design. Lastly, the spa-like bathrooms are to die for. Simply beautiful. They are crafted of Nero Saint Laurent Italian marble. This precious, black natural stone is embellished by golden and white veining. Plus be pampered with Acqua di Parma bath amenities. Are you ready to plan a trip to Rome, Italy and stay at The First Roma Dolce hotel? We don’t blame you! The Life of Luxury is available to plan and book your next luxury getaway.